When you think of Fort Lauderdale, Florida the first thing that crosses a majority of people’s minds is the beach. Thousands of people from all over the world come to visit year-round to check out our clear blue waters, warm sand, and variety of boardwalks. Always striving for that beach body makes exercise an extremely important part of most locals regimen. While keeping our beach body in check is on the top of the list during vacation, so is safety in unknown territory. American Top Team’s drop in Jiu Jitsu classes in Fort Lauderdale are the perfect way for the whole family to burn those calories, have fun, and pick up some self-defense strategies as you go. Next time you are visiting South Florida drop in to American Top Team located near Downtown Fort Lauderdale. They offer a variety of martial arts programs not only for adults but for kids as well, designed to help you get in shape or push you to take it to the next level. We recommend dropping in for one of their Brazilian Jiu Jitsu classes to get a good feel of what this gym is all about. Try out the facility if 7.000 square feet and train with a Master Junior Fernandes Junior. Their visitors pass for only 25$ a Day or 90$ a week. For those new to martial arts, Brazilian Jiu-Jitsu is a combat sport and self defense system that focuses on grappling and especially ground fighting. Jiu-Jitsu emphasizes getting a larger, stronger opponent to the ground in order to use ground fighting techniques and submission holds to offset physical strength. Master Junior began training in Jiu-Jitsu when he was 15 years old. He was trained by Máster liborio, who is a world class teacher and MMA coach. He worked his way up until he received his black belt in the sport then moved on to help others receive their own. His passion for the sport hás motivated students from all around the world to continue training and never give up. Every instructor here shares the same respect and passion for the sport. This means you will be learning hands-on from instructors that have already gone through all of the essential training required to receive a high degree belt in the sport. Tourists all over the world have dropped in to this facility and received knowledge they will take with them wherever they go. We hope to see you soon! If you’re visiting Fort Lauderdale for vacation, work, or school check our schedule here and drop in for amazing jiu-jitsu classes. I was visiting for a few days and train out of Canada so I dropped in for the BJJ classes. The staff was helpful and friendly. The students are generally friendly and helpful and bring very little ego to the mat. There’s several black belts at this school, all who roll with the students, which is certainly a plus, and something you won’t find everywhere. It is not difficult to get some direction from the higher belts, as they have as many purple/brown/black belts as white belts. I should also note that this is a good school if you are starting out in BJJ. They don’t appear to throw any white belts “through the grinder” and have “fundamentals” classes for starters. 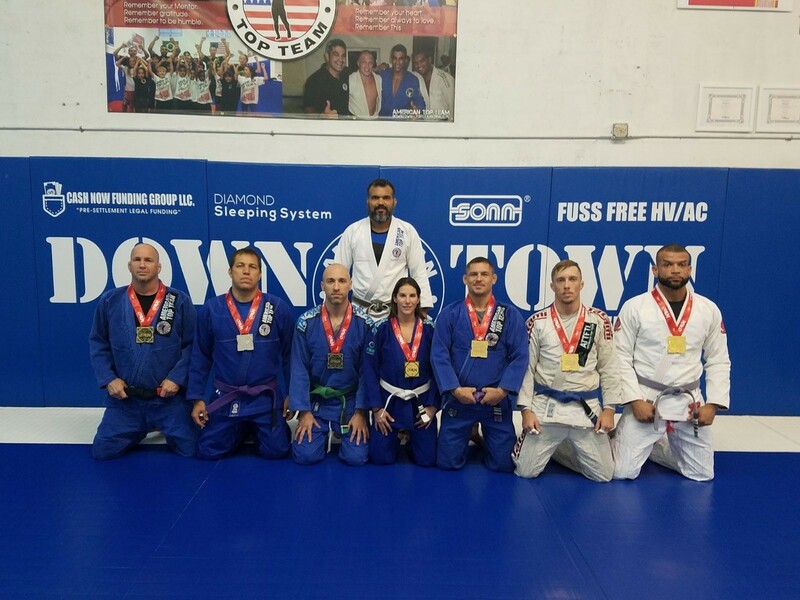 I was visiting Fort Lauderdale for work and needed a break so I researched local Jiu Jitsu schools. The staff at American Top Team was extremely friendly when I stopped by to ask about a single drop in class. I came early for the no-gi class and was able to warm up on the mats since there was no BJJ class ahead of us. (MMA has a separate training area in the building) Master Junior ran a great organized and efficient class. HE helped pair me up with students of similar skill while we were rolling. The students were great, no egos. Overall this seems like a great school to train at or just pop in when you need a break from your vacation. I would absolutely stop in again when I’m in Fort Lauderdale.